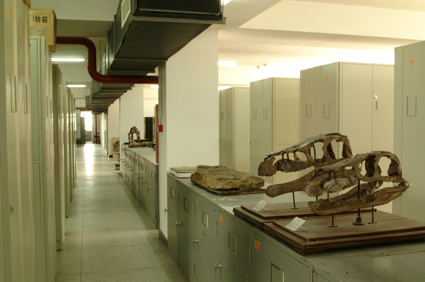 The Department of Specimen Collection, namely the division of curatorial work of fossil collection, is mainly housed in the fourth-floored of the IVPP main building with a total area of 1200 m2, and a storage of about two hundred thousand catalogued specimens of vertebrate, human and stone artifacts collected since the 1920s, which is the largest in Asia and also one of the best among the institutes of the same kind all over the world. There are about 2000 holotype specimens in storage, and over 5000 specimens and casts from abroad through exchange and gift. Besides, there are about 2100 specimens of morden vertebrate, including many rare ones from South America, Australia and so on collected in the 1920s. Moreover, there are more than 600 morden man skulls of different races in collection. Recently, more and more valuable specimens such as fossils of feathered dinosaurs and birds collected from the west of Liaoning Province, and aquatic reptiles from Guizhou Province have been put in storage. Among them, at least 100 specimens have been published as holotype in the world famous academic journals such as Science, Nature and the like alone. These specimens have made an impact on Vertebrate Paleontology in the world so intensive that more and more research fellows at home and abroad are fascinated.